The Milwaukee Mitre Saw has a 254mm blade which delivers large and accurate cut capacities. The mitre saw can cut up to 307 cuts in 38mm x 89mm soft wood accurately and repeatedly with the steel detent plate. The POWERSTATE™ motor gives the user up to 2x longer motor life and 25% more power. Simple settings of bevel angles to the left and right are easily achieved with the quick release bevel setting with detents. Maximum support is given to the materials being cut with the large sliding fences which also provides accuracy and stability. The Mitre Saw is available as a single item (body only excluding batteries and charger) or as a bundle which includes battery/batteries and a charger. Accuracy is key when it comes to mitre saws, which is why Milwaukee mitre saws are the best available. The Milwaukee sliding mitre saw uses a 254-mm blade and is capable of cutting up to 307 cuts in 38mm x 89mm softwood. This is with total precision because of the steel detent plate with preset angles. Accuracy can also be attained with the LED light, which illuminates the cut line and work area to improve visibility whilst cutting. Large sliding fences can provide accuracy and stability with maximum support to the materials being cut, which makes working with the Milwaukee cordless mitre saws simple and safe. Power is also important and the Milwaukee sliding mitre saw is powered by the impressive POWERSTATE™ motor, which provides twice the motor length and 25% more power. Milwaukee mitre saws also use a REDLITHIUM-ION™ battery pack - this allows for 2.5x more runtime, 2x battery life and 20% more power. The tool and battery stops from overloading thanks to the smart REDLINK PLUS™ intelligence system. Buy Milwaukee cordless mitre saws with SGS Engineering today. You can purchase the saw as a stand-alone item, or as part of a bundle package with a battery/ batteries and a charger. 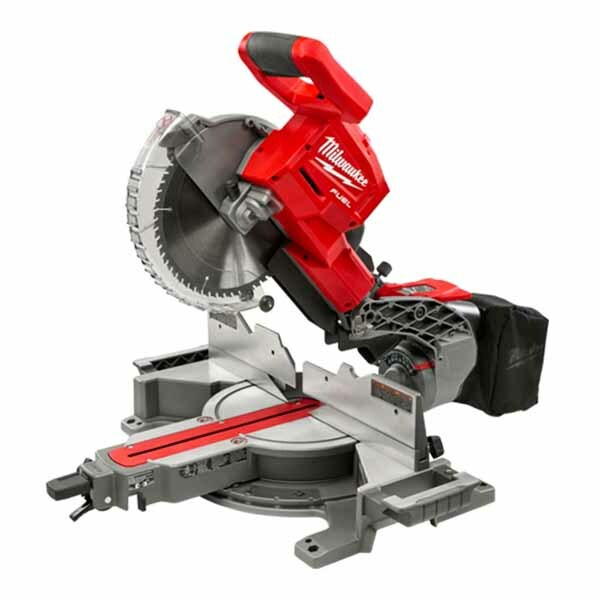 Buy now and experience the superior performance of Milwaukee mitre saws for yourself.